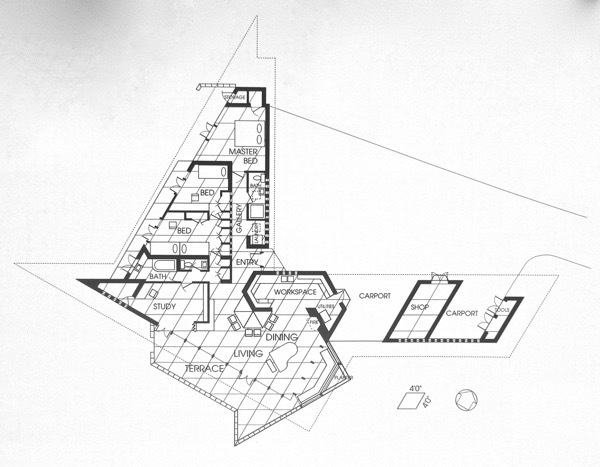 Smith/van Fossen/Cuneo used shifting floor grids/ceiling panels to demarcate the shift in geometry (30-60-90) between different wings of the 1940 Gunning House. 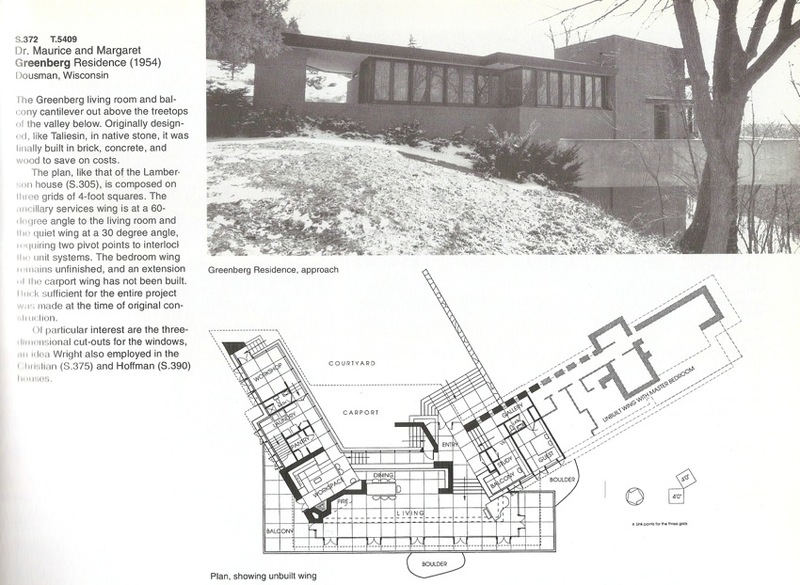 I looked for similar patterning in Wright's Usonians and the first example I could find was in the Howard Anthony house from 1949. 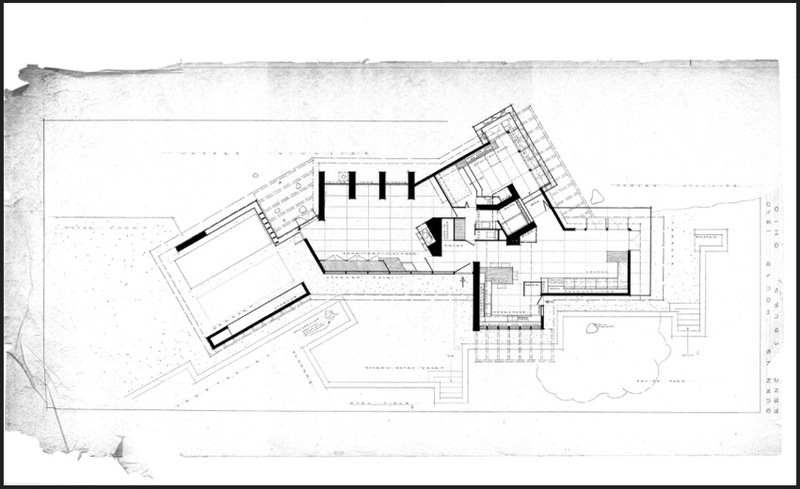 Do other FLW Usonians shift their grids to the angle of the house? They had just worked on Armstrong before receiving the commission and I checked but Armstrong keeps a consistent grid. Thanks in advance! 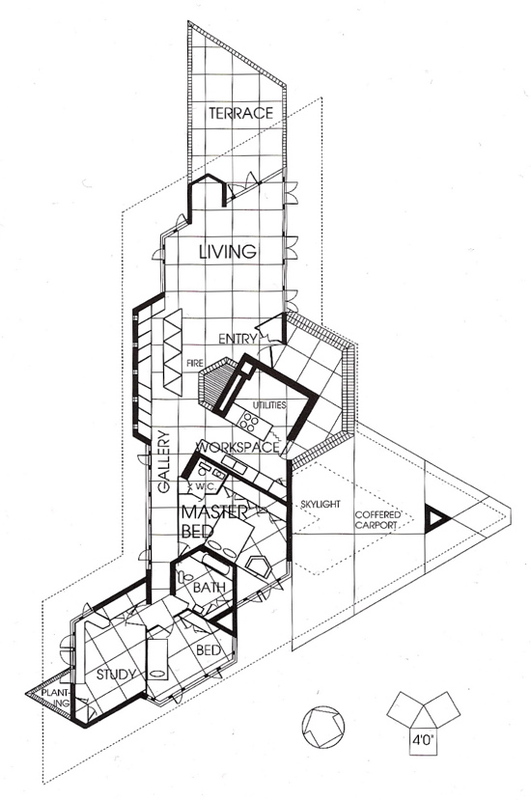 reference Storrer's "FLW Designing Democratic America Part 1 of 2", Anthony House floor plan, pg 138. BTW Glenbrow will be hosting a Spring Tour May 4 to benefit Columbus Landmarks Foundation. Our location requires participants to be bused to the site. It will be listed at CLF in the near future. Actually, even though Armstrong's grid is consistent on each level, the two levels are shifted. Others include Walter, Lamberson, Neils, Edwards, Greenberg, Harold Price, Sr. and Rayward (which, given its wandering plan and TAA's involvement, may be considered somewhat of an outlier). Here's a treat . . . Thanks Roderick and SDR. I would guess that visually one would not pick up on the shift between floors, although apparent to those in charge of building the structure. I was looking to see if Wright had shifted on a single story and for the houses you listed, it occurred beginning in the late 1940s. research predates Storrer and the Monographs, perhaps, so he can be excused ? Storrer is cited, however, in the piece . . .
"Unisonian" is a variant we haven't seen before; perhaps someone could use that as a sound-alike knockoff moniker, for a new line of work ? 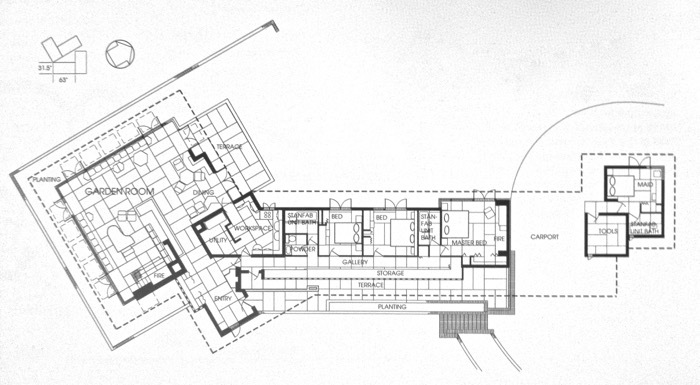 And does anyone have plan drawings of the house in its final, built-out form ? I seem to recall seeing those, somewhere . 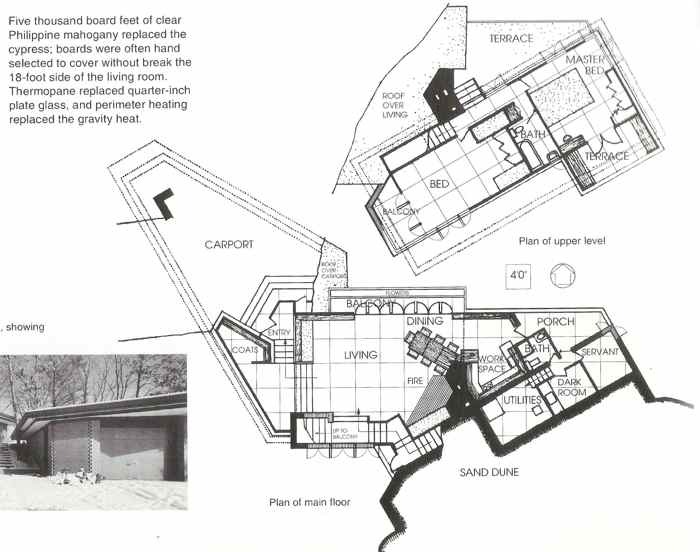 . .
To Roderick's list can be added the Howard Anthony plan, which Besinger tells us he drew, based on the Maginel Barney exercise---which was used by Mr Wright in the same year for the McCartneys. Here is the list, in chronological order. cranked plans are bracketed within two two-year clusters, beginning in 1948 and again in 1954. And, of all the plans shown here, only Lamberson sports not two but three orientations of the square grid . . . ! 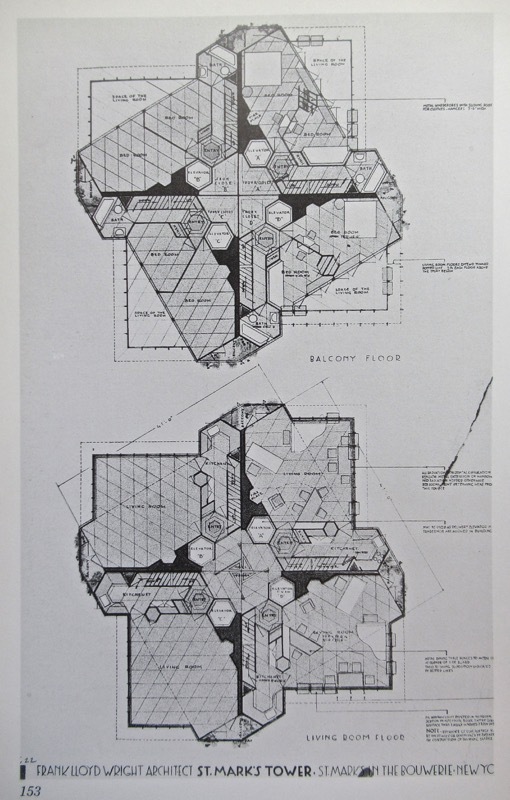 Although FLW did not start displaying his grids until the Usonian era, he always used them, as he put it, "whether you see them or not." Perhaps the only shifted grid prior to Usonia was Yamamura, which has a wing at the back angling off at 120 degrees. 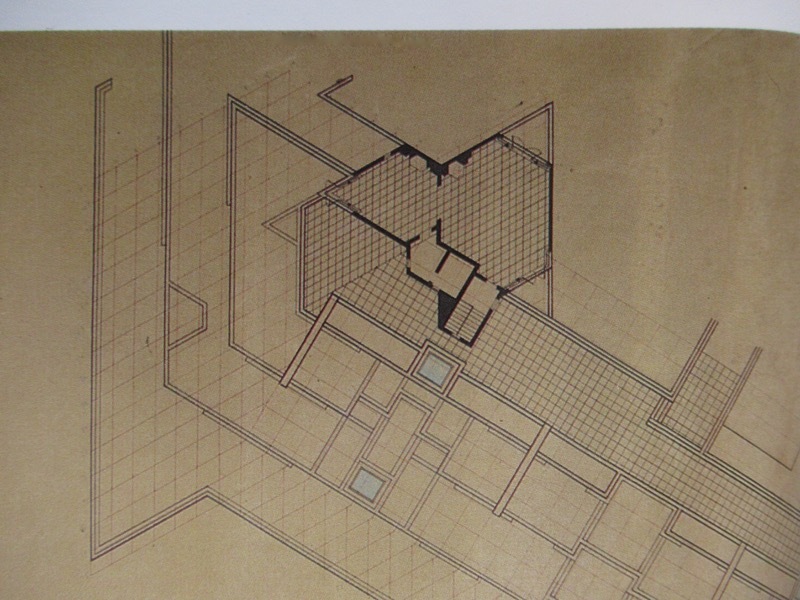 Storrer shows a square grid, but the original plans didn't show it, yet it is there. 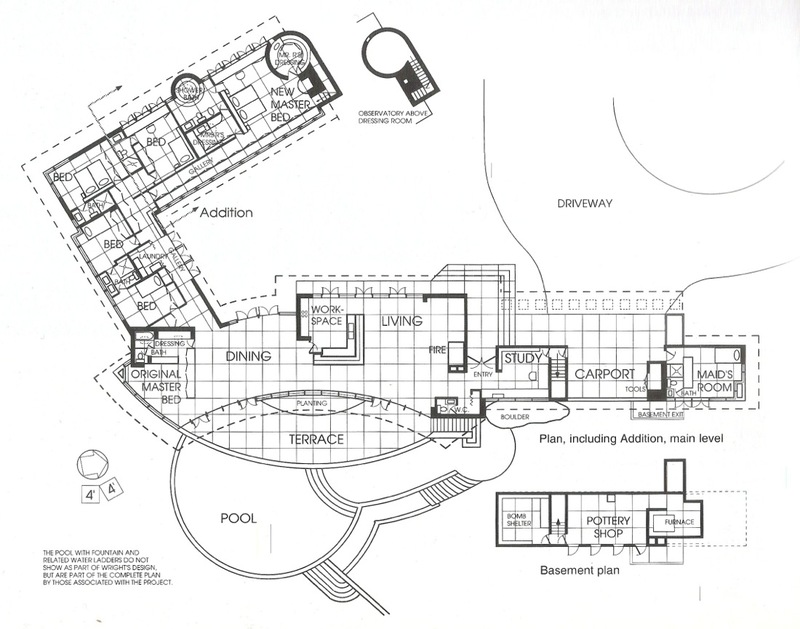 The next task is to go through Mono and account for all the unbuilt projects that show a shift. SDR? Are you up to it? I am if you are. Are we talking just the post-1935 era, or the whole career ? Either way, you can take half the volumes and I'll do the others. Wow SDR! Thank you so much! How great to show the transitions all in a row. The Gunning attached carport on the left of the second plan became 2 small kids bedroom w a bath and utilities room in 1948. 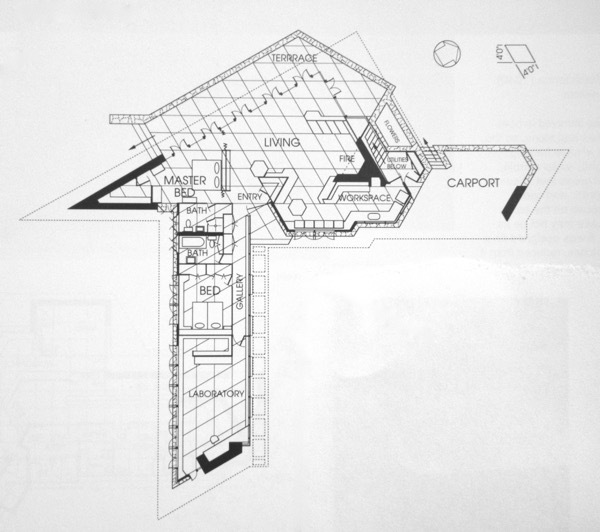 The gridded floor plan and 2X4' ceiling panels above followed the Point Room grid (the outer walls, facing wooded hillside, being parallel), thus transitioning to another shift. e could use that as a sound-alike knockoff moniker, for a new line of work ? Masselink? I think not. More probably a John Howe work. Mmm---thanks. The warm tones suggest age . . .
Mm, I noticed that a projecting trellis (?) at the top of the Tower appears shifted from the plan of the tower, in one of your photos. Does that show on any drawing that you have or have made ? 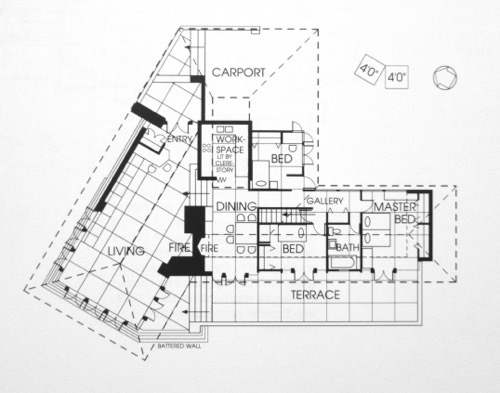 The Price Tower drawings show 60º grids shifted, on each quadrant of the plan. San Marcos . . . the mother of all grid mash-ups ? Mr Wright must have been amused by the coincidence in the names . . . These are the current ones. Maren is looking to upload the original plans which are not as built from a file. I'll let you know when the originals are ready for viewing. This album of my daughter has other current floor plans and drawings if anyone is interested. Ay, yes the Suntops Homes, where my trio of architects worked, with Tony Smith becoming "Clerk of the Works" before Armstrong. Seems rotated angles were ingrained into their psyche.